~~~~~~~~~~~~~~~~~~~~~~~~~~~~~~~~~~~~~~~~~~~~~~~~~~~ On October 14th 2013...my life was changed for the better or for the worse. I am still on this bumpy road trying to make each day even better. 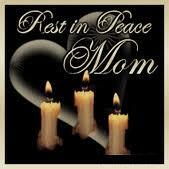 That day I lost my mother...my best friend...the best mom I could have. I miss her beyond words can express. Don't let a day go by that you don't talk to your mom or give your mom a hug. I would give anything to see, hear, feel, touch, and love her again. RIP MOMMA! !